The longest, hardest, coldest, and snowiest winter most of us has ever experienced has finally, definitely, and absolutely come to an end. Spring is here and the time has come to get back out there, my fellow winter hibernators. Michigan has so much to offer in the way of outdoor fun and Northern Michigan is undoubtedly a premier destination for family fun, but we also boast tons of great events and attractions down here in Southern Michigan. So rub the blur out of your eyes from your long winters nap and check out my recommendations for four of the best ways you could spend a Saturday this spring. The Eastern Market is just plain cool. There is so much to see and explore. There are entire pavilions devoted to hanging plants, potted plants, flowers, trees, and shrubs. It is a great place to gather all of your spring gardening needs at RIDICULOUSLY low prices. Take a wagon (or two) to hold the plants while you continue exploring. My crew’s bounty from the Eastern Market last spring. Past the plants are pavilions dedicated to Michigan-made products and produce. Amish folks from Up North bring amazing baked goods with them. We grab some fresh bread (and perhaps a pack of cookies) every time we go. They also have tons of varieties of pickled goods, candies, popcorns, coffee, fruits, and vegetables from across the Mitten. There are tons of cool antique shops lining the streets outside the market pavilions. There is a BBQ joint that smokes its pork out on the sidewalk, so as you stroll, you catch that amazing aroma every once in a while. The scent emanating from Supino Pizza draws crowds that line up out the door throughout the Saturday lunch hour. 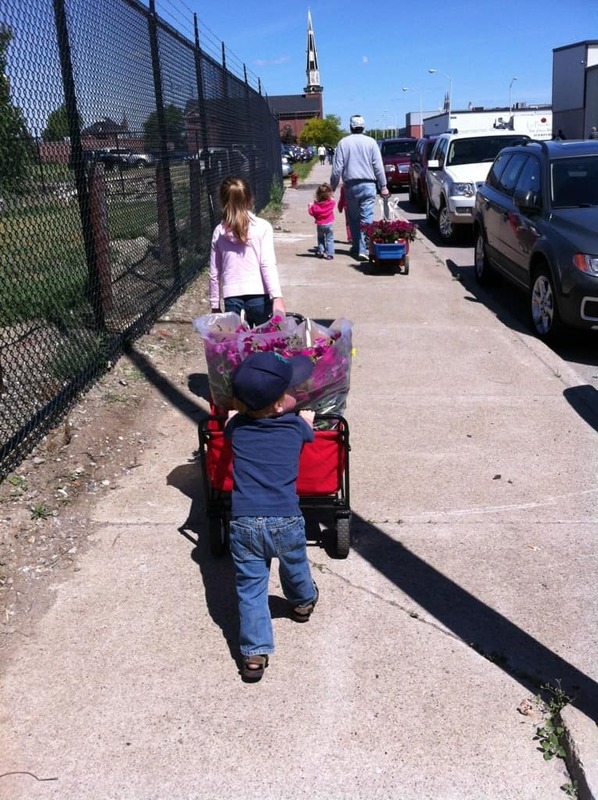 The Tulip Time Festival is a giant spring festival dedicated to…you guessed it…ROSES! Kidding. It all began back in the late 1920s when Holland (the city) purchased 100,000 tulip bulbs from Holland (the country), which is internationally famous for its tulips crop. In 1929, as the tulips bloomed, word spread about the beautiful scene on Michigan’s west coast. Today, festival organizers estimate that the Tulip Time Festival draws more than 500,000 visitors over the course of the week. Attendees enjoy parades, music, dancing and, of course, lots and lots and lots of tulips. Six million tulips, to be precise. The Tulip Time Festival runs May 3rd through the 10th. The EL Art Fest has grown into a pretty serious event on the national art scene. The festival’s executive director, Michelle Carlson, estimates that the festival draws nearly 70,000 attendees. According to Carlson, the festival draws artists based on a jury system. Essentially this means that an artist must submit an application and a sample piece for consideration, then a jury of artists chooses the best submissions and invites only the finest artists to participate in the festival. This year, 82 Michigan artists made the cut. They will join hundreds of other artists and craftsmen on May 17 and 18th in downtown EL. Check it out. Now that I think of it, some of the folks in Alma might actually consider themselves to be Up North, but for this article, we’re drawing them south on that imaginary line. Anyway, highland festivals are pretty interesting events, and the Alma Highland Festival is no exception. They have guys in kilts. Some of those guys will be participating in bagpipe competitions while others will be throwing telephone poles and giant 50 pound stones and lots of other stuff. Lots of big dudes throwing heavy stuff. Check it out. Seriously. They’ll have a Scottish reenactment village, dancing, and a parade. There will be a border collie exhibition for the dog lovers. Head up to Alma the weekend of May 24th. Tagged Alma, East Lansing, East Lansing Art Fest, eastern market, Holland, spring, Tulip Festival.